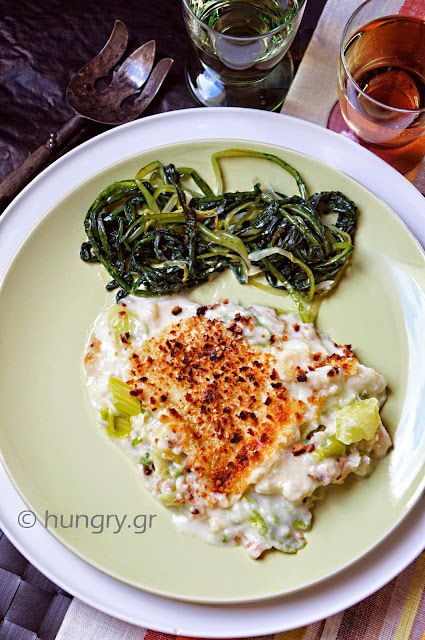 Fish fillet combined with leeks, bathed in a tasty mustard cream and sprinkled with grated cheese and crumbs of sesame bun, which give the dish tasty and crunchy crust. 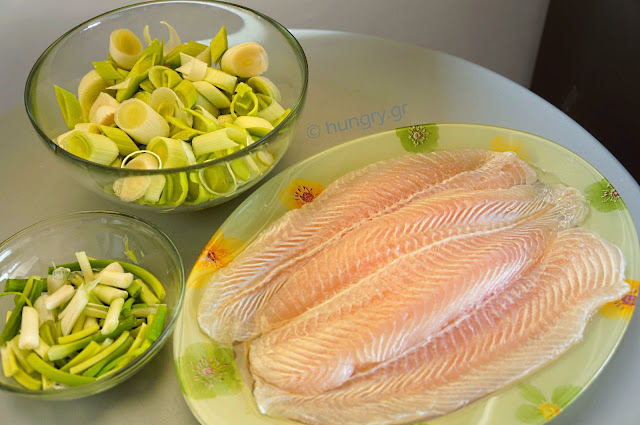 An inexpensive, tasty meal, a different option in order to enjoy the, usually flat taste, fish fillet. 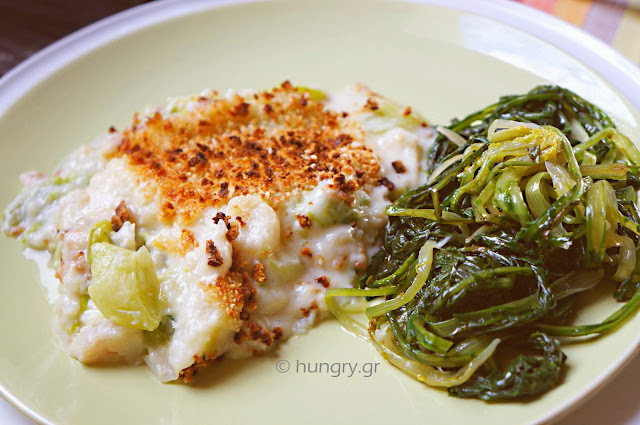 Served with a green salad, boiled greens and of course with a dry white wine. 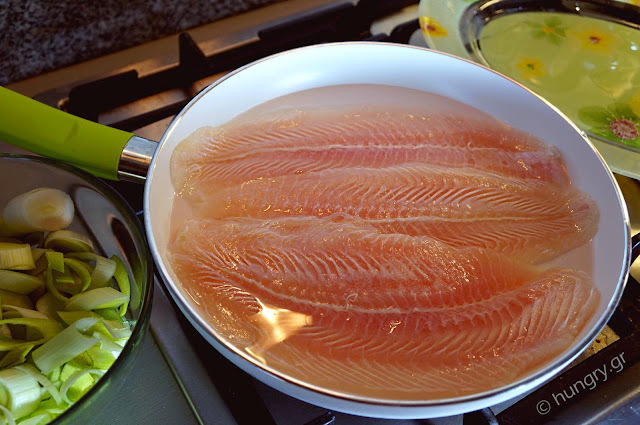 In a large deep frying pan put the fillets and cover with water. Boil them for 5'-6' until cooked and you can separate the flesh with a fork. Remove them from the pan to a platter and allow to drain and cool. 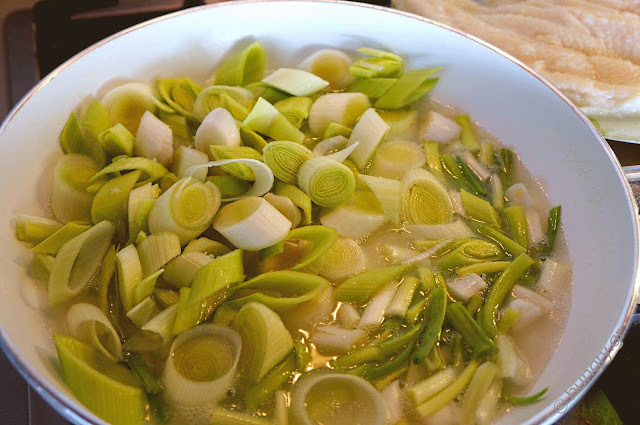 In the same pan, in the same water put the leeks and the onions and boil for 4'-5' to soften. Put them in a colander and let them drain well and cool. Meanwhile we make the cream. 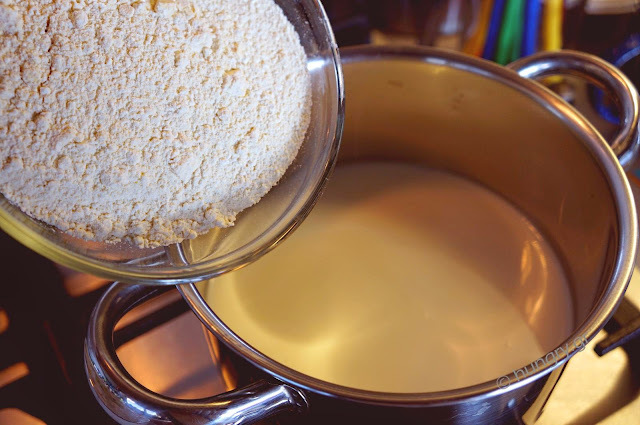 In a small saucepan over medium heat add the milk and as it still is cold add the well-beaten egg and flour. Stir constantly and allow the mixture to boil and thicken. 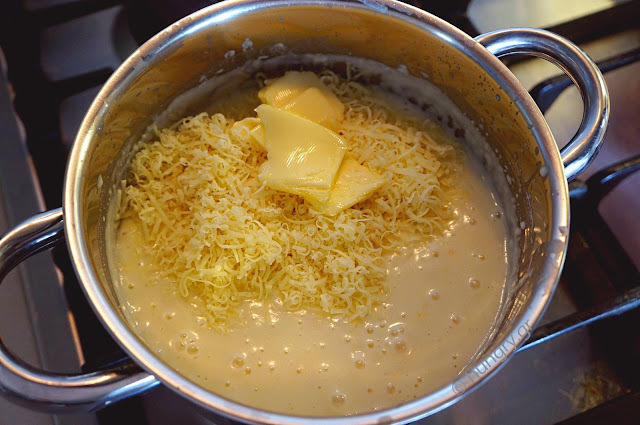 Once the first blisters boiling are created, remove from the heat and add the mustard, salt, pepper, butter, and half the grated cheese. Mix well. Leave the cream aside for not long. 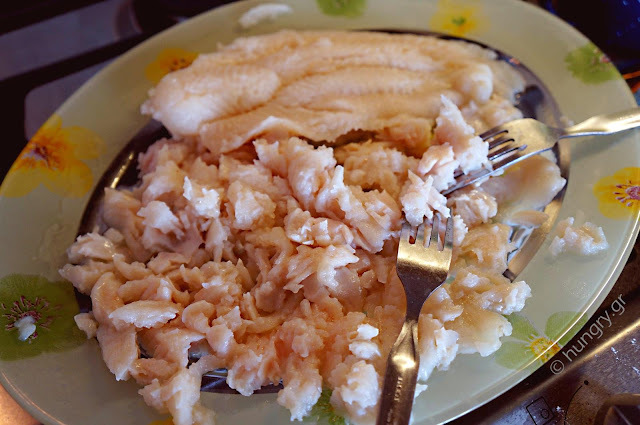 With the help of two forks crush, bite-sized, the boiled fillet. Salt and pepper. 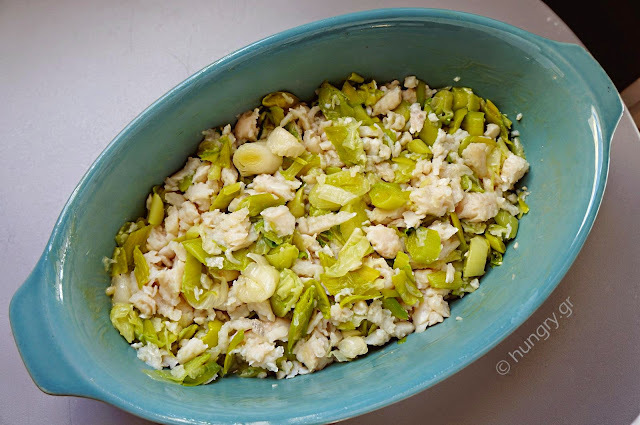 Above the fish, add the drained leeks and stir to mix the ingredients well together. 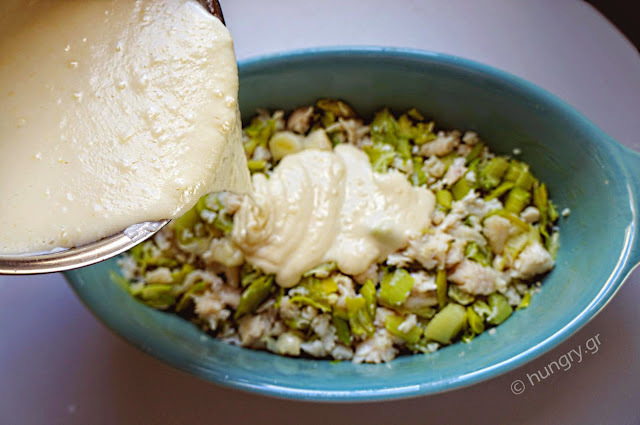 Grease an ovenproof dish and pour through the mixture of fish-leeks. You lay well over the entire surface with a fork. On top add the cream, that you prepared, to go everywhere in the whole surface. …and top cover with the cookie crumbs. Bake in preheated oven at 180°C (356°F, Gas:4.2) for 20'-25'. 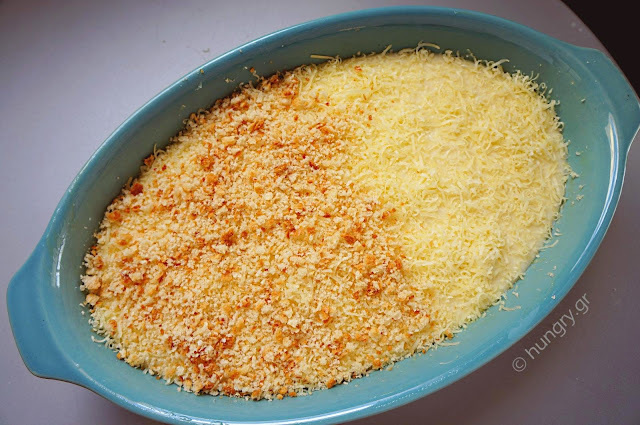 Just to melt the cheese and golden crumbs. As long as the oven is preheated, put in the ovenproof dish and warm up well before filling with the ingredients of food. When you remove the food from the oven and before serving and leave 15' to cool and get tight to let you cut nicely. Mine was served hurriedly, before it could cool. 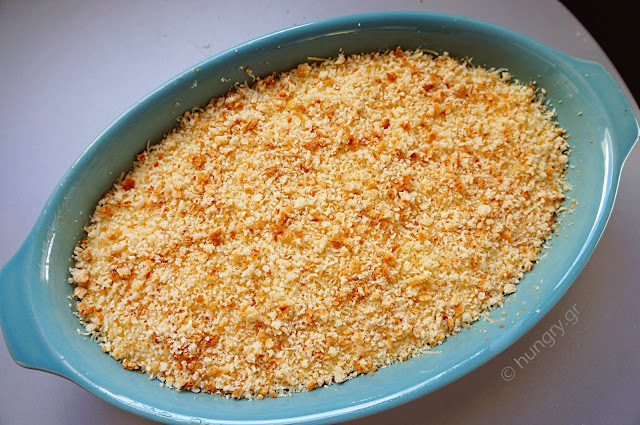 Today, the menu is “leeks au gratin”. 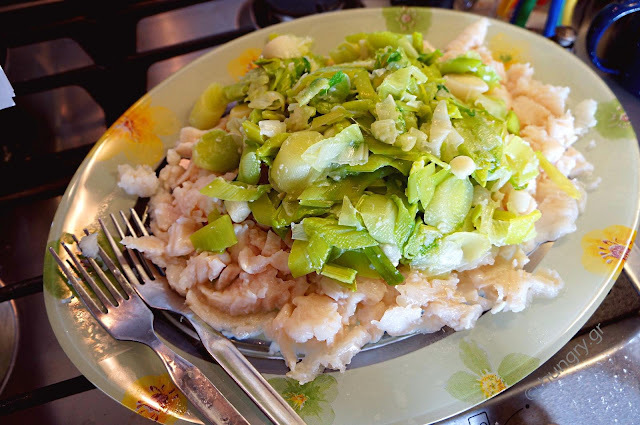 It is a delicious, filling dish but despite containing a lot of vegetables it has more than its share of calories (for those who want to have control over them). However, if you like it, as we do, I highly recommend it! 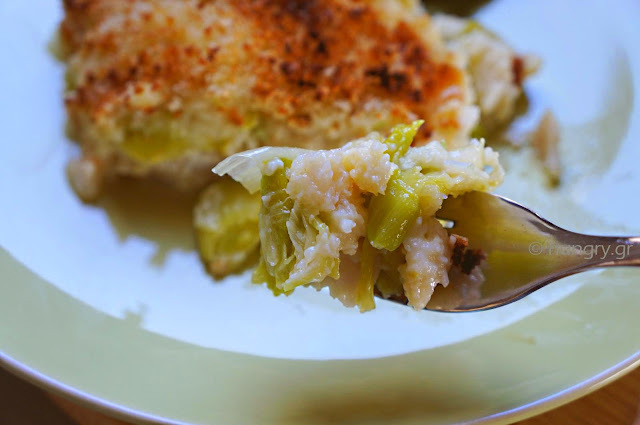 Enjoy leeks in a different way, I believe to your enjoyment. Cod fillets, accompanied with leeks, potatoes, celery and carrot. 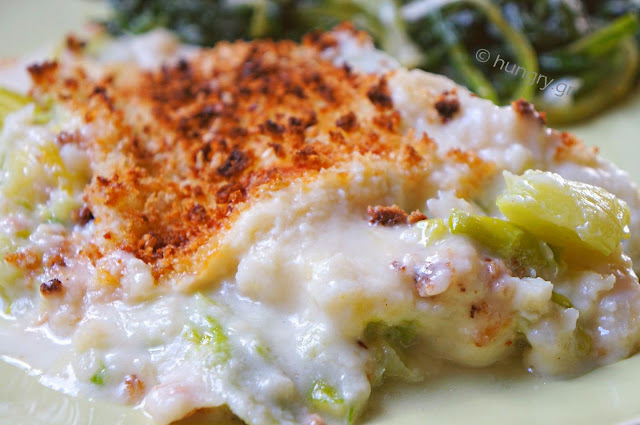 A delicious suggestions to enjoy a hearty meal of cod with vegetables. 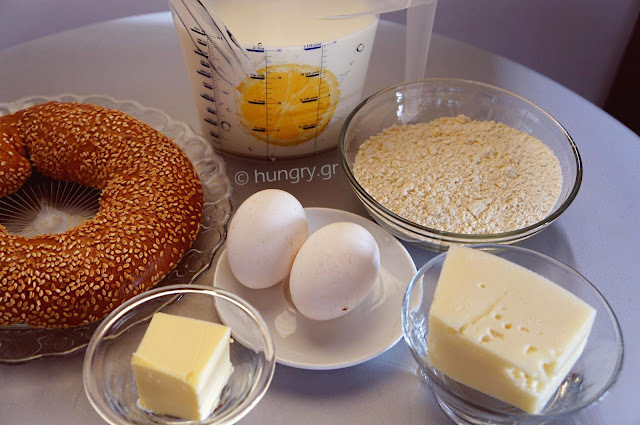 Enjoy it with piquant olives and maybe with a little feta cheese.